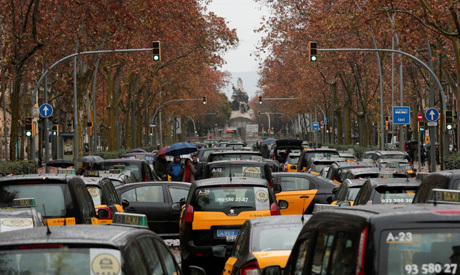 Dozens of taxis in Barcelona went on indefinite strike on Friday, blocking a major thoroughfare in protest against online ride-hailing services like Uber. The protest comes ahead of a similar work stoppage due on Monday in Madrid just two days before the Fitur international tourism fair, one of the world’s largest, in the Spanish capital. The strike follows new regulations unveiled Friday by Catalonia’s regional government forcing clients to book VTCs (Tourism Vehicles with Chauffeur) like Uber or Cabify at least 15 minutes before the actual time they are needed - a measure criticised as unfair by taxi drivers. “From now, us taxis will go on strike indefinitely in the Gran Via,” a street that crosses Barcelona, federation Elite Taxi said in a statement. On Friday afternoon, dozens of cars were blocking the street that had already been occupied over the summer by taxis in another protest that then spread to other cities. Three people were later arrested for disorderly conduct and damages after they tried to block another central street with containers, the Catalonia regional police said on Twitter. A VTC car was vandalised by a group of individuals and its driver taken to hospital after suffering a panic attack, the emergency services said. Taxis argue that VTCs are not a taxi service by law and should therefore be booked 12 to 24 hours ahead of time. “We want them to differentiate both services and the only way to do so is via pre-booking,” Luis Berbel, head of the Taxi Union of Catalonia, told AFP.